SnapCacklePop: Lady Gaga leaks new song Stache..! Lady Gaga leaks new song Stache..! Lady Gaga has been busy on her world wide Born This Way tour, however that hasn't stopped her recording material for her new album ARTPOP. Though rumoured not to actually feature on the Fernando Garibay produced album this new single Stache (Can you Feed My Love) gives you and ideas of what to expect and we at SCP HQ are loving it. More club electro sound, it has a great beat and melody and sounds more like material from her The Fame Monster album. Yippee. Check it out below, we think it's remix but what ever. 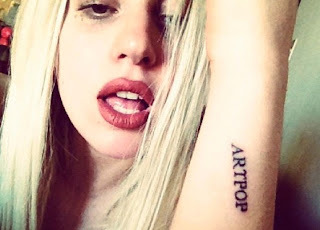 ARTPOP will be released early next year..!